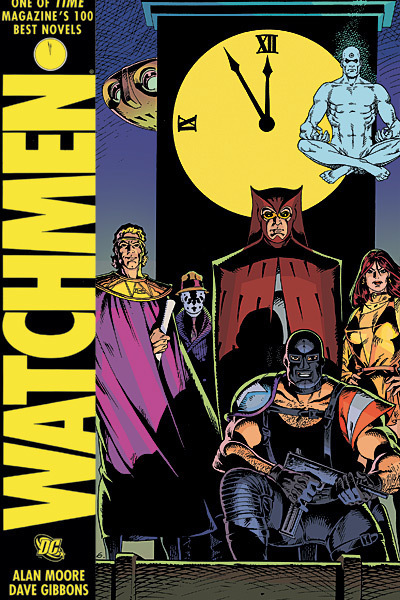 Reminding you that comic books aren’t just for kids, Alan Moore’s graphic novel Watchmen is mystery thrill-ride for any adult reader. Set in an alternate version of 1985, the United States and Soviet Union are on the brink of nuclear war. The symbolic doomsday clock has been set at three minutes to midnight as the Soviets have invaded Afghanistan and look to push their advantage into Pakistan. Armageddon seems inevitable. An aging masked crime-fighter, ironically named Comedian, has been murdered; thrown through the window of his high-rise New York apartment. Only Rorschach, an outlying member of the younger generation of vigilantes, sees more than just a murder, “maybe someone’s picking off costumed heroes”. A success in the comic book world and mainstream press, Watchmen was included in Time Magazine’s List of 100 Most Influential Novels, and was named Wizard Magazine’s best comic book of all time. The graphic novel format might turn off casual readers, thinking it a traditional battle of good and evil like a classic Superman comic, but this is the farthest thing from it. There’s no such thing as good and evil. Instead it’s a moral battle of compromise seeing who’s willing to sink to the lowest level to do the most good. Focusing on character development, Watchmen uses a standard 9 panel format, intertwining pertinent dialogue over frames that parallel the conversation. Splicing in excerpts from character memoirs, psychiatric reports, and scientific journals between chapters, we’re gradually given a back-story showing us how these characters have changed over the past 40 years. Most prominently the story features a character reading a comic book, Tales of the Black Freighter. Mirroring our characters’ own journeys, the protagonist’s desperation drives him to become the very evil he first attempted to avoid. By the author’s own admission, Watchmen is a deconstructed super-hero story. Everyone is flawed, and even the noblest acts are fueled by greed, primal sexual urges, or an uncompromising brutal sense of utilitarian justice. Even Dr. Manhattan, an omnipotent god-like character, is hardly a hero. Losing connection to the man he once was, Manhattan distances himself from humanity, questioning its own value over a lifeless Mars. Chalked full of themes, one of the ones I found most prominent throughout the novel was identity; how these characters see themselves, who they are, wish they were, what they stand for, and how that contradicts their own actions and our view of them. Being a masked vigilante is like suffering from split personalities, each battling for control in a game of societal norms versus the character’s unique nature. This was my second read through (first since high school)¸ and it was definitely better the second time around. The story is so detail oriented the more you immerse yourself in the dialogue and back-story the better your overall experience. Don’t’ think of this like a comic book. It’s a multi-layered dialogue focused novel that happens to have pictures…brilliantly executed illustrations. It’s cliché to say it, but the book is better than the movie. The movie heavily focuses on the main story of the Comedian’s murder, which I believe it does very well, but without the side-stories and symbolism you get with the books, the movie plays out more like a dark comic book rather than a brilliant piece of literary work. It’s a breeze to read. Even re-reading certain pages or passages for understanding, a good reader could finish it in a day. And I think that speaks to how well the book is written; that it has garnered such objective praise with so little actual content. Here’s a kickass trailer to get you hooked.